Vitamin B complex supplements are a combination of all the B vitamins. These include vitamin B1 (thiamin), vitamin B2 (riboflavin), vitamin B3 (niacin); vitamin B5 (panthothenic acid), vitamin B6 (pyridoxine), vitamin B7 (biotin), vitamin B9 (folate or folic acid) and vitamin B12 (cobalamin). B vitamins are soluble in water, so excess amounts won't build up in the body but instead be excreted through urine. However, large doses of some B complex vitamins can still cause side effects and health risks. B complex is a multivitamin filled with all of the water-soluble B vitamins. 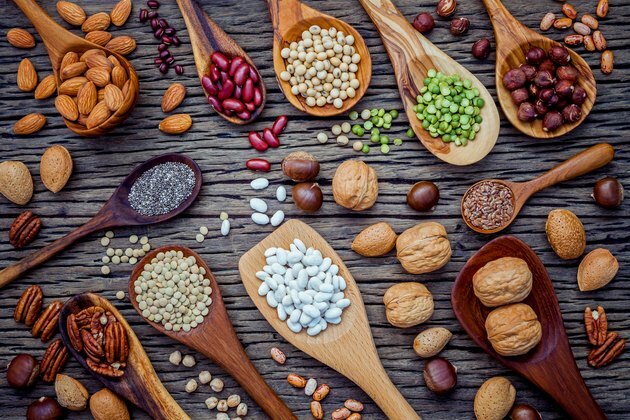 While there are no upper tolerable limits for most of the B vitamins, meaning that too much won't cause harm, you need to be careful about getting high doses of niacin, vitamin B6 and choline. If a blood test shows that you're not deficient in B vitamins, you don't need to supplement with vitamin B complex. If you have a vitamin B deficiency, the health risks can be serious. B vitamins are required for basic bodily functions, such as turning food into usable energy and creating red blood cells. Vitamin B complex supplements, taken under the supervision of a doctor, can treat your deficiency and complications associated with it, such as anemia and fatigue. Read more: What Are the Benefits of B-Complex Vitamins? Some people experience diarrhea, gas and nausea from taking normal doses of vitamin B complex supplements. If you experience excessive itching, hives, swelling, tingling or difficulty breathing, you may be having an allergic reaction and need medical attention. If you've taken too much vitamin B complex, some symptoms you may experience include blurry vision, nausea and vomiting, numbness, high blood sugar, liver problems and skin lesions. Side effects are most commonly associated with the B vitamins with upper limit levels, including niacin, vitamin B6 and choline. Change in urine color to a fluorescent yellow is a normal and harmless side effect of vitamin B complex. If you experience any uncomfortable side effects, see your doctor. Certain foods are fortified with B vitamins, including breads and cereals. If you're taking tablets that provide 100 percent of your daily recommended intake of B vitamins, you may want to eat fortified foods in moderation — and watch out for side effects. B vitamins interact with certain medications, so consult with your doctor before taking them if you're on any prescription or over-the-counter medicine. Taking one vitamin B complex tablet a day is not likely to cause toxicity, so you don't have to worry as long as you don't take more than the dosage recommended on the product label. For example, the upper safety limit for niacin is 35 milligrams daily for adults. If you take a tablet that provides 100 percent of your daily requirement of niacin, which is 16 milligrams, you would be pushing toward the upper limit with 2 tablets. Be sure to see your doctor before choosing a vitamin B complex supplement to make sure it's right for you. Do Vitamins Cause Liver Enzymes to Be Elevated?